UN-Habitat with the funding partnership of Livelihood and Food Trust Fund supports the Land Records Department of Ministry of Agriculture and Irrigation to improve the land administration and management system in the country. The Land Adminis tration and Management Program (LAMP) is to introduce new systems and processes to land registration and management of land records, new and advanced technology for land administrative functions, enhance training capacity of national training center and demonstrate tested processes and systems through pilots in township with the intention of scaling up across the country. The ceremony for the Official Opening of the Land Administration and Management Program (LAMP) Training Room within Central Land Records Development Training Centre (CLRDTC) and Basic Instruments and GNSS Training was hold on 9th March 2015 in Central Land Records Development Training Centre, SLRD, and Taikkyi in Yangon Region. 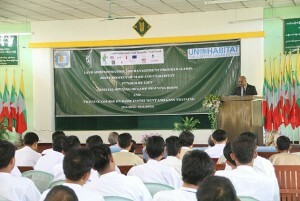 Officials from LIFT, UN-Habitat and SLRD attended the ceremony. 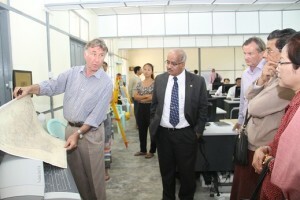 The training center is provided GIS workstations and state of the art survey equipment. With the new facilities the center can provide training for 20 trainees at a time. At the ceremony U Tin Aung, Deputy Principal of Central Land Records Development Training Centre urged the participants to learn the subject with a commitment not only for one’s own understanding but to disseminate the knowledge gained to the staff at respective townships in order to implement the project activities. Mr. Bijay Karma charya, Country Programme Manager of UN-Habitat Myanmar, stressed that “the purpose of LAMP is to strengthen land administration and management of the department by testing new processes and technologies at small rural and urban pilot sites.” He noted although LAMP is particularly focused on land tenure security also it also emphasized land valuation assessment and information management”. During the project period there will be 43 trainings on 9 subjects of surveying, geographic information system, adjudication, information technology, data capture of records, etc. The training, both theory and practice , was held from 9-13 March for participants from Thayarwaddy Township, Bago Region, Myingyan Township, Mandalay Region, SLRD (HQ) and from CLRDTC.